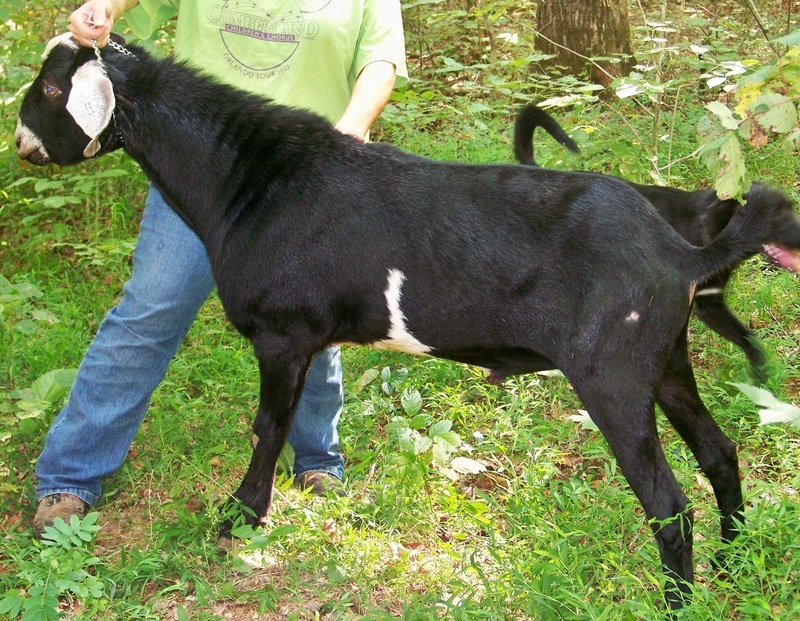 Jazmyne was our first registered dairy goat. She has taught us a lot over the years. She has an awesome, socked-on udder. All of her daughters have been nicely level with well-attached udders. We lost Jaz in January of 2018 due to kidding complications. She will be missed. We have her daughter, Just-a-Minute to carry on her genetics. Dandelion was born on 12/31/08, and I purchased her 4 days later. She was the first kid I bottle-raised, and I spoiled her rotten! She is a sweet, curious doe. 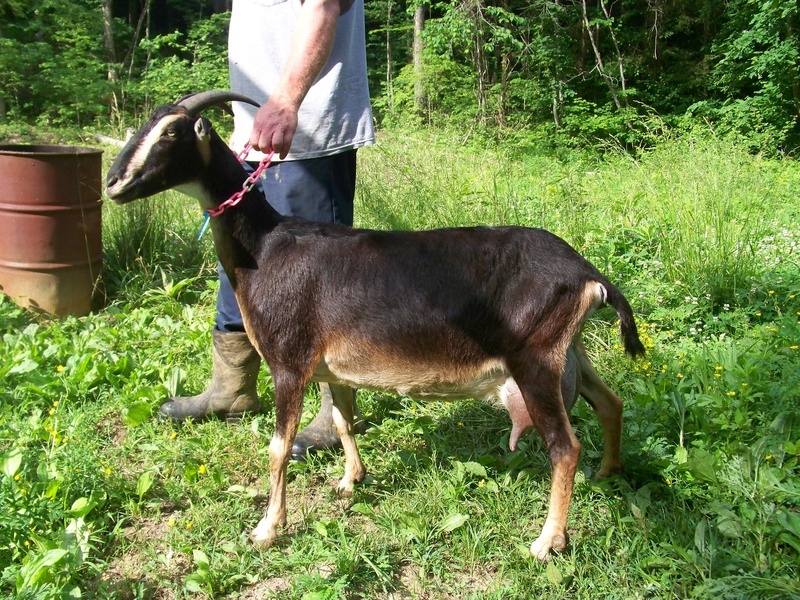 Her sire was a registered LaMancha, and her dam was an unregistered Nubian. Dandelion is not registered. Dandelion has excellent milk production with a nice, strong, even lactation. She is the foundation doe of our 'D' line. 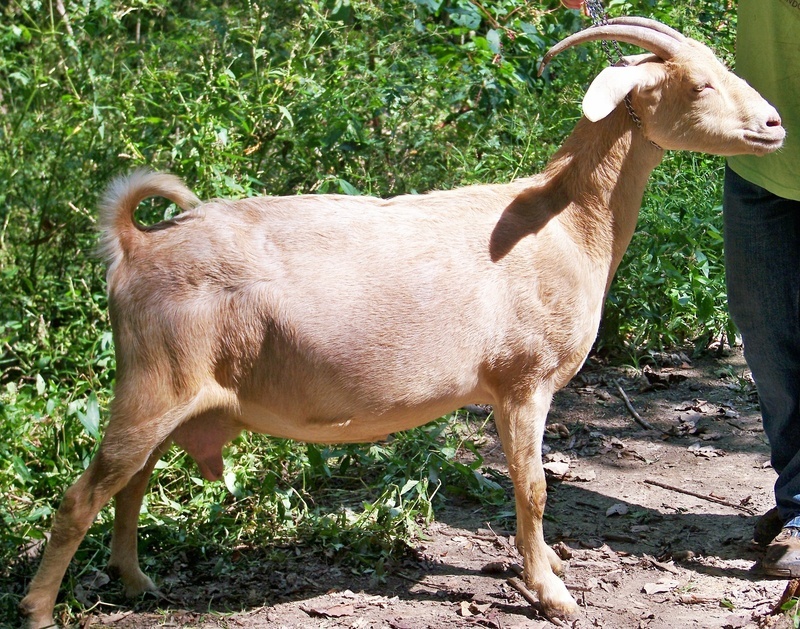 Morgan is recorded as Native-on-Appearance LaMancha. She was born 3/11/11, and joined our herd as a bottle-baby. We purchased her with her 2 litter-mate brothers. 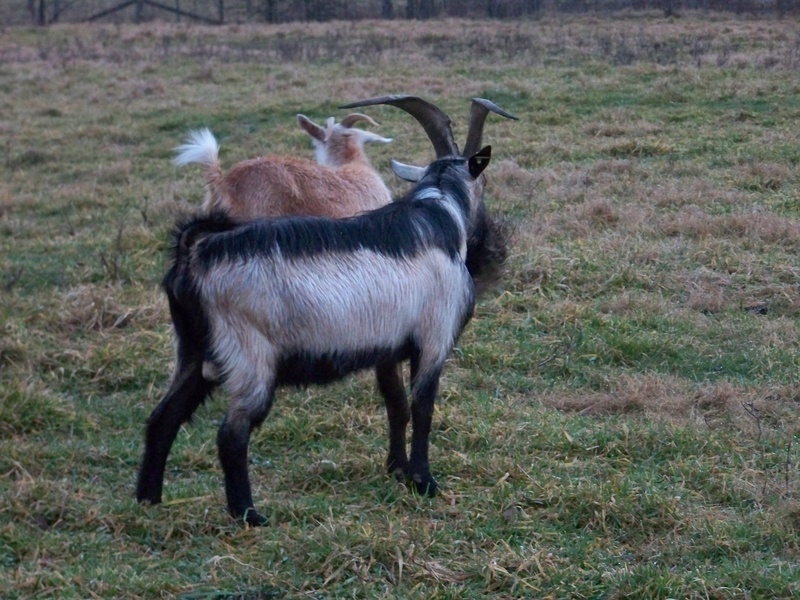 We were so impressed with the farm they came from, that we went back 5 days later and purchased Marcia and Dasha (above)! Morgan was recorded as Native-on-Appearance in 2014, and earned her milk star with her 2014 lactation. We've retained two daughters and 2 granddaughters in our herd. She is the foundation doe of our 'R' line. 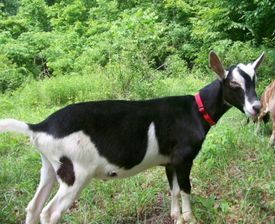 Misty was our first dairy goat. We traded two Boer kids for her. 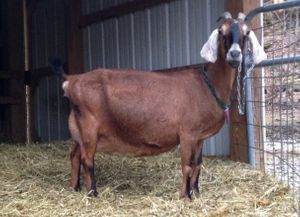 The intention was that she would be a harness mate for our Boer/Nubian wether to drive a wagon. I trained her to harness, but ended up milking her, as she had such a capacious udder. She completely converted me to milk goats, and I've never looked back! 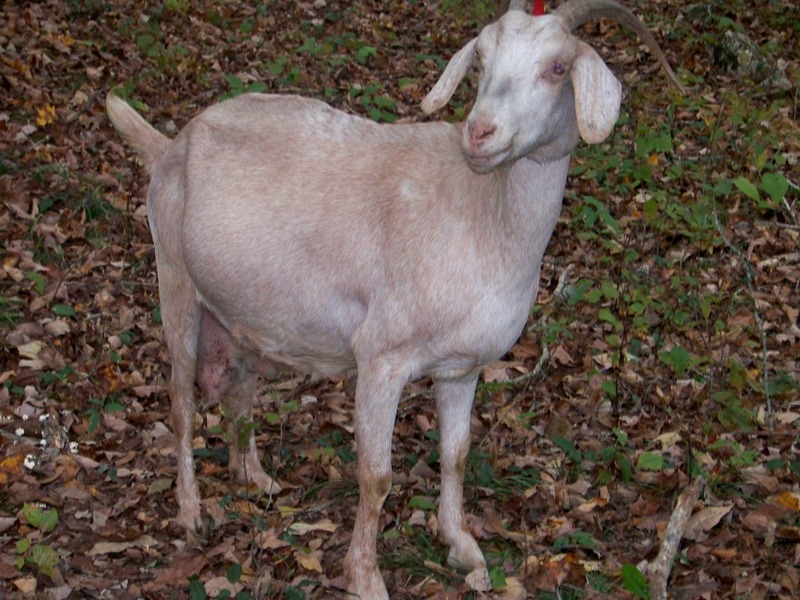 I believe she is a Nubian/Saanen cross. Her milk was the best-tasting milk in the herd. Misty was sold after kidding in March of 2012. Although we have no descendants in our herd, she will always be remembered as the doe who started me on the path to contentment! Half-Pint is the sire of a few of our does. We used him for the 2012 through 2014 breeding seasons. He has now been sold. 'Half-Pint' is a stunning young buck - very correct. He is growthy, tall, and long. He gave us several very correct does in 2013 - we can't wait to see them freshen! 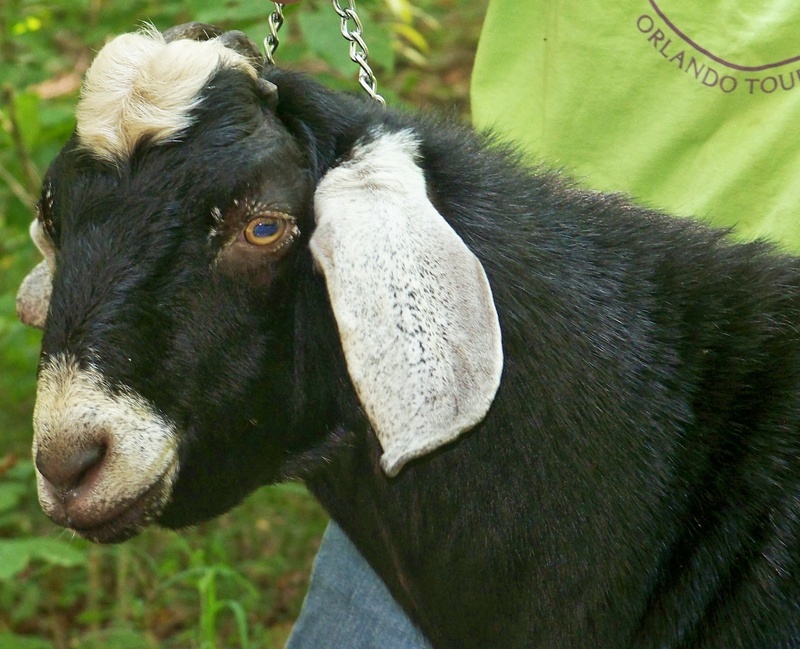 Moose joined our herd in January of 2010. He has matured into a stunning buck. Unfortunately, he is unregistered. But, he's nice enough that we retained two of his daughters before selling him in the fall of 2012. One daughter, D's Darlins MT Dande Dakota made the Breed Leader list for her 2016 lactation. His other daughter, D's Darlins MT Rebecca Lee is our second-highest producer in our herd. He left some strong genetics behind! We added Comanche to bring in the excellent Redwood Hills genetics in his background. We are hoping he will cross well with our Tacoma daughters. He will be used on some of our junior does this fall. We retained one son from Comanche - D's Darlins Koo Koo Ku Hoo.